- Crystal Lewis sings with the Tones on "Away From You" live. - The Supertones #13 on This Week's Christrock.net's charts, and it's the highest mover of teh week, going from #23 to #13! - There's a new design at http://www.supertones.com check it out! I taped all 30 mins of that wonderful show. It was an amazing show, at one point Matt's mic flew off the stage and he said it must have been depressed and said, "It's all over!!!!!!" then at the encore they played some light Jazz for us and made sure we brought back a clean plate to the buffet table (you had to be there) also, the new drummer is ok, I liked Sam from Stavesacre muuuuuuuuuuuuch better, and before i forget, I met Steve, our faithful moderator He has bleached hair and if you're not looking at him right you'd swear he was Jason Carson or a brother of his or something, I got to talk to Ethan, Dan and Matt. Well I have pictures and I will scan them later. - At http://jesusfreakhideout.com/sounds/s.asp you can find 24 seconds clips of all 15 tracks to, "Hi-Fi Revival"
4. "Hold On to Jesus"
Hey kids. We just got back from a few shows in California. Magic Mountain and Redding, CA. They were both great show. At Magic Mountain we played with Skillet and Bleach. In Redding we played with Pax 217. We still have shows on the weekends so keep checking the tour dates for shows. Please check out http://www.seespotrock.com for details. Leave your email address and info will be forwarded to you as soon as it's available. A few years ago FIF did a side project and it was pretty dark, will GI be anything like that, if not dark at least more personal? Not at all, this is the opposite of dark. its really rock and poppy and very influenced by the clash, costello and the pixies. Content is right on...you'll like it. sweet, I thought the FIF side project was good but depressing, I'm glad you guys are keeping it postitive. I'm coming to your show at Big Spring Jam on September 29th, do you think I can request a song? If you could make it possible I would love to hear, "Spend It With You" or "Hanani", if you could I would be so thankful. Later. I took out the best quotes and stuff and put them below. Question: You guys have together for a while, what 6 years? Question: Oh eleven. What took you so long to get to Parachute, what's the hold up? Question: Does it matter that you guys are all getting a little bit older? Have you noticed that there's a difference in how you relate to people? Matt: You're in time out. Question: You've just been in Australia, at Sonfest, is that right? Are Australians different at all from a typical American audience at all? Is it the same once they get moshing? Tony: They do everything on the left. Matt: We went in the Skytower. That was fun. I was scared. Question: Did you do the drop off? Dan: We did the glass thing. Matt: We never even got off the elevator we were that afraid. Question: Do you get much flack from the media or people in general about being in a Christian band and having tattoos and stuff? Dan (who has no tattoos): No, actually I've never had that problem. Question: Were you happy with his producer, Neill King was it? Question: What was that like, was it quite inspiring? Aaron: What's with the liner notes as well, all the different kind of get-ups in that? Matt: It was like three in the morning on the bus and we were like, kind of playing with that whole idea, and then we were just like..."Hey we could have an astronomy club..."
Aaron: The Any Given Day CD's, how much involvement did you guys have with that? Dan: Jason, our old drummer, he just basically, he just played drums on one song...he just organized it basically. Matt: But everybody always says to me, "I love that CD", I'm all "Thanks dude". Stones891 (7:45:07 PM): hey I hear John is going on tour with the Supertones, is that true? Stones891 (7:50:27 PM): so this isnt a for sure thing yet? Stones891 (7:51:48 PM): one more question!!!!!!!!!! Reubenmanagement (7:53:23 PM): tour dates in general for john reuben? He basicly told me that John touring with the Tones isn't for sure yet. The O.C. 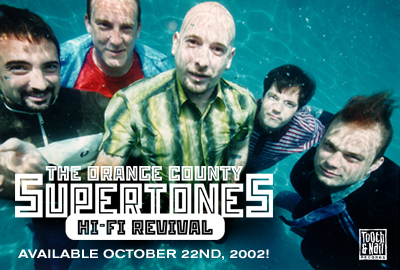 Supertones are gearing up to rock the country with the much-anticipated release of their new album, Hi-Fi Revival, on October 22nd. The launch will take place in their southern California home, at the Tower Records in Long Beach. Los Angeles KROQ, one of the nations top rock stations, will be in attendance to help promote the event. Brilliantly produced by experienced duo Brent Bourgeois (WOW Hits 2002, Chris Rodriguez) and Charlie Peacock (Audio Adrenaline, Switchfoot, Ravi Coltrane) Hi-Fi Revival delivers original and cutting edge music that presents an evolution of the band and their pop-rock sound. Its being described as equal parts Elvis Costello, The Ramones, The Clash, and James Brown. Band manager Steve Thomas says, The Supertones are in good company with bands like No Doubt who have their roots in the Orange County ska movement but have moved on to make great pop records. Hi-Fi Revival has a fresh, relevant pop rock sound that proves this band has evolved. Producer Charlie Peacock says, The Supertones have come up with some fresh musical flavors, all the while retaining their original SoCal coolness. I think this new CD is like a box of cinnamon Altoids--strictly irresistible. The Supertones just wrapped production on the video for probable first rock single, Super Fly in Los Angeles. The video will be included on a promotional DVD set to come out later in the year. Next spring, the band will head out on the See Spot Rock Tour with Relient K, Pillar, and John Reuben. The tour, running from February through May, will be a one-day rock event set to hit approximately 50 cities. More information on the tour will be announced soon.
" Hey everyone! Sorry i have been gone for a while. we have been busy with playing shows and Mojo and I just got back to Seattle today to finish up the GI record. Last night we played Florida at Universal Studios and it was amazing! We played with Relient K and the crowd was off the hook....did i just say "off the hook?" wow....anyway....If anyone is in So Cal., on the 22nd we are playing at Magic Mountain with Bleach and Skillet....please come if you can...its going to be so much fun. well, that is all for now....i hope and trust everyone is doing ok. bye bye "
Go to the link above and click on 'GALLERY' to see pics from the Tones recent video shoot of "Superfly"
" Hello everyone out in Supertoneville. Sorry for the delayed update. We are winding down the summer season right now and still playing shows on the weekends. This fall we have a ton of shows on the weekends so check out the tour schedual for dates. Mojo and I are in the studio right now hacking out songs for the Grand Incredible record. We are tracking 16 songs and we will probably record a few acoustic B-sides including an acoustic version of "Hold on to Jesus", songs we never used for either record and maybe an Elvis Costello cover. The record is being produced by Aaron Sprinkle from Poor Old Lu. He has done such great records as MxPx- Pokinatcha, Blenderhead, Kutless, Demon Hunter and the Grand Incredible. " - The record is sounding amazing! 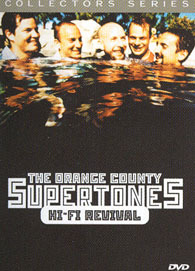 The new Supertones record, "Hi-Fi Revival" is about to be pressed and we just saw the artwork and it looks great! Remember, the release date is October 22nd! - We will probably be doing a release show in LA. We also just filmed a new video for the first song off of the record, "Superfly". We filmed it in South Central L.A. with Derek Dale who has worked on our videos in the past.